A few years back she and her husband bought a summer home at the Jersey shore and one of the goals she shared with me began with breaking down precisely how many weeks were in the summer, well that is, how many weekends the shore home could be used during the warm months adding on a couple of weekends onto the early and back ends of pleasant seasonal weather. She was determined not to miss a single weekend opportunity. It was rather striking to ponder this view, recognizing the reality of limited fleeting moments when one considers cool weather beginning in late fall, long winters, and relatively cool springs. There may be some lazy hazy days, but summer time requires maximizing, and my friends point inspired me to re-think how I plan out the hot weather season, in particular, rather than casually viewing the calendar jotting down invites, and fitting in barbecues. I now look at these precise number of weekends more as limited treasures purposefully planning all desired adventures within the precious window of time. Of course among choices, there are so many choices, and then there is life. So this summer life threw a curve ball at my next door neighbor, though in all good ways, but, limiting her ability to maximize the shore weekends. This has caused me some stress, in a constructive sort of way, for her usual precise, to the point texts, have recently gone on as a whirling dervish of activity, and like a geese busily pecking at its seed, keeps me on constant edge questioning myself if I am absolutely certain that I’ve got each weekend of this limited seasonal time frame maximized. Thus far have been trips visiting friends in Delaware, a short vacation in Maryland, eating plenty of ‘all you can eat’ spicy Old Bay boiled crabs on the Eastern shore, water taxi’s in Baltimore, visiting friends in Annapolis and other fun weekend travels as well. Sigh. With no extra time available between so many choices, this packed schedule in its timing then left out the annual Pick Your Own Strawberries at area farms and so, thus missing that short window of time occasion, was not about to have the blueberry season pass me by. 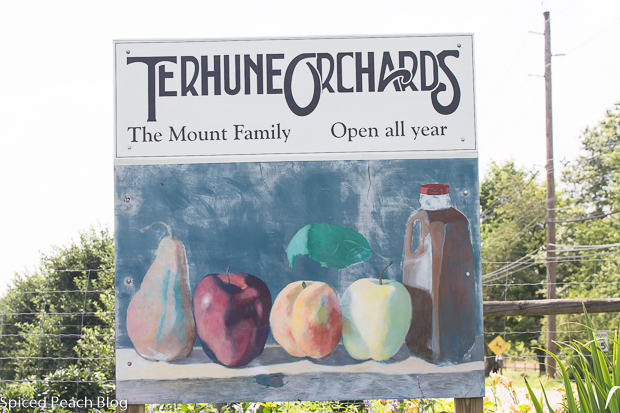 With our youngest, Alex the Athlete home from Baltimore for the weekend, on Saturday morning we loaded up the car and drove about forty-five minutes to one of my choice places for a summer PYO visit, Terhune Orchards in Princeton New Jersey. Now it may be that the fruit itself, blueberries, and their ripe flavor between the sweet and tart are commonly the same, but just as no single blueberry is the same, this too sustains between individual PYO farms and orchards growing and producing among a diverse range of fruits and vegetables, no two are ever alike. 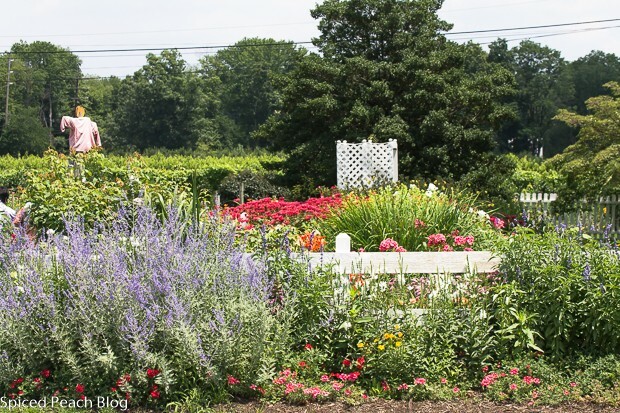 Off side of the entry area pulling into Terhune Orchards features a lovely, colorful flower garden with an area just beyond for picking your own flowers. The day’s Blueberry Festival at Terhune featured some extra fun activities but the first activity at hand was the picking. 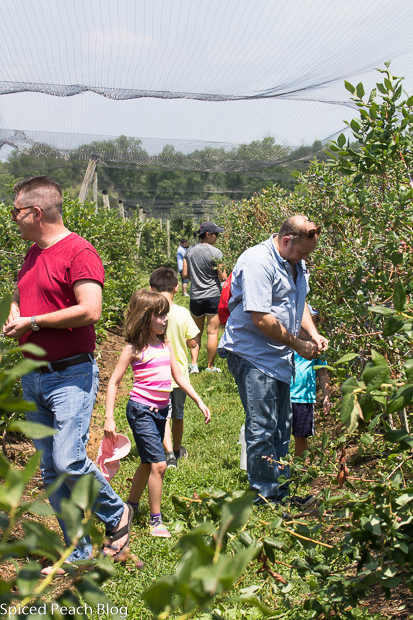 After an initial $5 per person entry fee, each picker then paid a three dollar fee and received a ticket, a coupon of sorts reducing the price cost of the blueberries based on each participant picking at least one pound per person. An hour or so later, plastic lined buckets balanced between fingers, we weighed in at somewhere nearing four pounds and then redeeming the coupon tickets paid something like $2.35 for the batch, not too bad for a day of entertainment and clear bags of one of the healthiest foods in the universe, which ironically so many people seem to actually really love. That says a lot for the blueberry, I think. With plenty of blueberries to prepare a variety of dishes I first opted for today’s old fashioned Blueberry Crumble which really is so easy and quick to prepare that I could have made it upon returning home from a hot day out on the field and later enjoying the festival, but alas we already had restaurant reservations at a local Italian restaurant that evening (you know, maximizing the summer days) while actually also celebrating Bob’s upcoming birthday with Alex being home. The Orchard brought out lots of pickers lining the center isles between the mounded strips of blueberry bushes on either side. Still, there were plenty of ripe berries to go around and plenty more room to pick them continuing along the overhead cover netted paths. 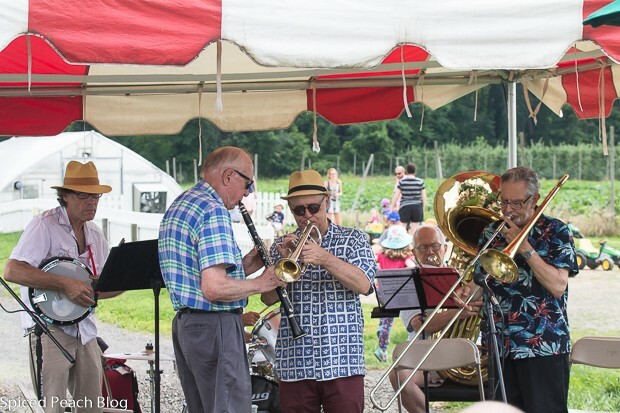 Bushels of peaches lined the shelves outside the small Terhune Orchards Farm Store offering the usual fruits, vegetables, homemade pies, cider doughnuts and a refrigerated section hosting the dairy, cider, juices and some of the farm prepared sauces and salsas. It seems the cat was more or less entertaining itself rather than serving guard to the just picked. Peaches are still not ripe enough for my personal preference and so I shall, as usual, wait until a bit later for picking among the harvest. Large tents overlooked the grounds of the orchard which after a free tractor ride circling the grounds noted it as smaller than many of the PYO farms visited in the region, this too made it a bit more intimate. Beyond the tents were children’s outdoor games and even a wooden cow with udders stationed with a bucket beneath for the children to practice milking a cow, eventually each child got the knack, but it was quite entertaining to watch in the interim. 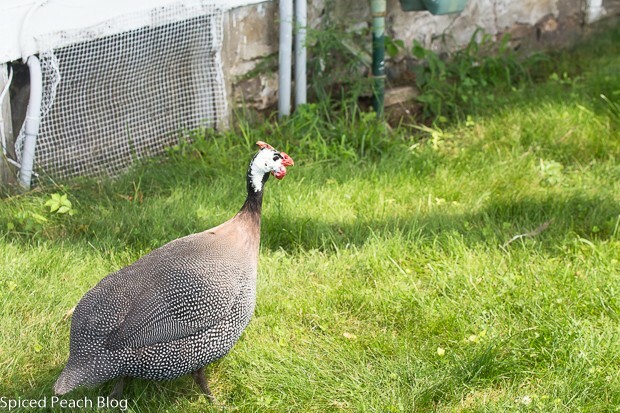 Wild guinea hens wobbled around the premises, this one above on the way to check out the high piercing squabble going on between its other feathered friends alongside the big farm style house. 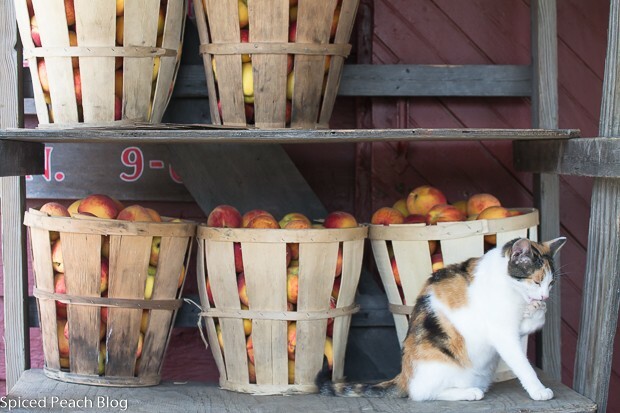 Easy to stroll the grounds enjoying the various natural elements, Terhune Orchards also hosts a small art gallery, and nearly adjoined, a wine tasting area that at glance resembles a small stone cellar style storefront, as the Orchard also produces wine, including a Peach variety. With plenty to entertain us and otherwise, with a 9 year old, we never made it back for the taste testing. Talking about production, with no band name displayed, these gentlemen provided upbeat high quality entertainment with everyone having a grand time listening to them from young to old, including a young boy around three who was getting his groove on dancing up and down precisely to the beat in between the lined picnic benches, it might have been a viral video it was so hilarious. Perhaps this was a small gig for the talented musical group but between listening to them under the tents, or, picking blueberries to the beat, they sure did sweeten the day, and add to lots of fun, especially that is, when one is intent on maximizing the limited treasured days of summer. 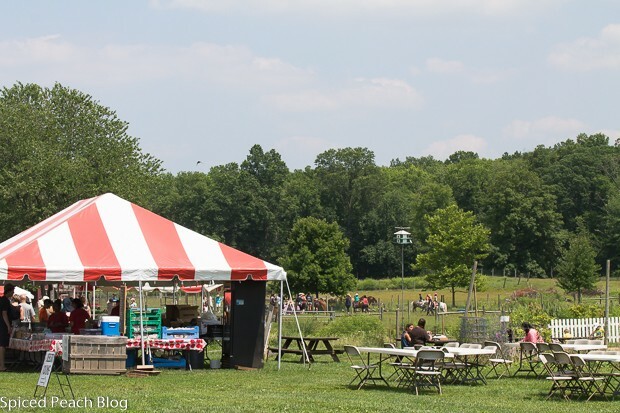 Terhune Farms is located at 330 Cold Soil Road in Princeton New Jersey. You can check our their ‘Pick Your Own’ schedule here. 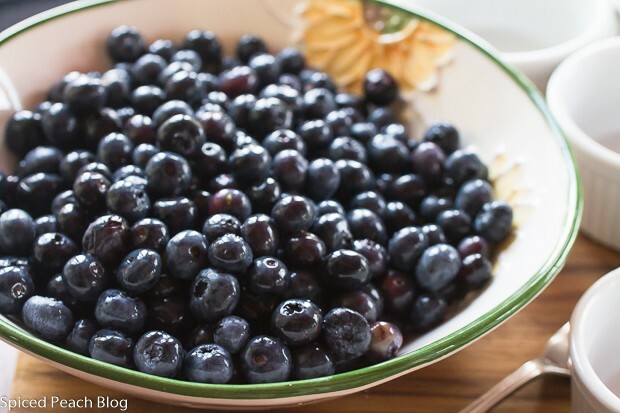 Quick and easy dessert to prepare, even on the day of picking your own blueberries. Tumble clean, stemmed, blueberries into a glass bowl, pour over the lemon juice, stir. Grease 6 ramekin cups with butter. Preheat oven to 350 degrees. Using a fork or your fingers work together the softened butter, flour, salt, and brown sugar until evenly well mixed. Stir blueberries, spoon into ramekin cups almost to the top leaving a half inch space. Top blueberries with the crumble mixture leveling out at the top. Place filled ramekins onto a baking sheet lined with parchment paper. 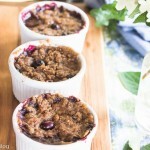 Slide blueberry crumbles into the oven and bake until bubbling hot, around 25 minutes. Blueberry Crumble may alternatively be prepared in a greased glass pie plate or tin. This entry was posted in Artisans- Farms -Markets-Chefs- Journeys, Sweet Treats and tagged Blueberries, Blueberry Crumble Recipe, PYO Blueberries, PYO Blueberries at Terhune Orchards, Terhune Orchards, Terhune Orchards Princeton New Jersey. Bookmark the permalink. Post a comment or leave a trackback: Trackback URL. Tasty dessert with less ingredients..Sure I will try it sometime..
Hi Remmy, thanks so much, the crumble is old fashioned delicious, few ingredients and lots of flavor. Enjoying your Indian recipe collection so much! Dear Peggy, a visit o a lovely farm like this one is always very special. Looks like you had perfect weather, great music, fabulous local fruits and berries and the best company. 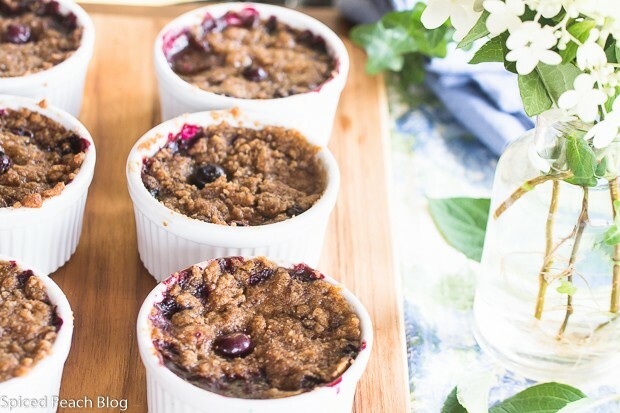 Blueberries rank among my very favorite berries and I simply cannot imagine anything more delicious and summery than preparing a lovely blueberry crumble with them – your recipe looks like a fabulous inspiration. We go blueberry picking in August and I will most definitely keep your recipe in mind when we do. Hello Andrea, so wonderful to see you- as you are in my thoughts having been impromptu going through our CCC recipes all week! Having a ripe garden one thing leads to the next… and I figure, why not make another of the dishes tonight! Of course, each has been delish. We did have a lovely time out at the orchards and I always enjoy the Pick Your Own journeys, though I did get behind my time this summer… one only has time to pick one thing or another. Blueberries are among my very favorite berries too with so much flexibility of preparation, and among these just popping them in ones mouth enjoying the pure fresh flavor. Looking forward to your August story on your blueberry picking adventure along with a beautiful recipe, I’m sure. Thank you for stopping by. What a fun, PYO farm. I prefer the tiny Maine wild blueberries fresh (and frozen) to the bigger ones you find in the stores and local farm stands, but when they’re cooked, you can sweeten them to your own liking. I love blueberry crumbles, galettes, and cobblers. This looks delicious. Served warm with a spoon of good vanilla bean ice cream? Perfect! Hey Peggy! Jersey weather is totally unpredictable for sure. Once when we were driving up in late October, it started snowing. I was in the less crowded patch of the NJ turnpike, somewhere around exits 3/4 I think, and whaddayaknow, fat snow flakes started falling. I know what you mean about making most of those weekends. The blueberries, OMG. Really miss berries here but especially blueberries. Fresh blueberries are not seen at all! The peaches look so nice in the bushels. I would end up spending a fortune in such a place. 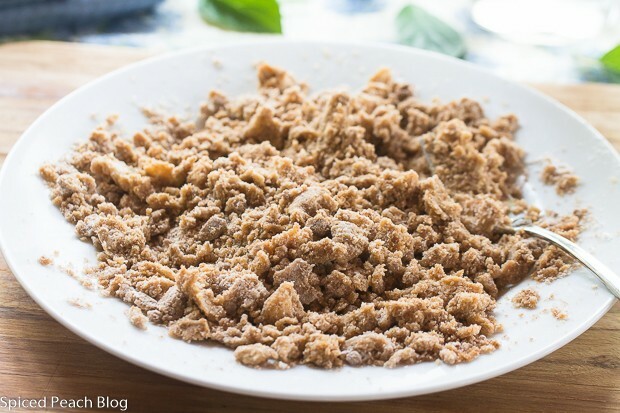 The crumble is simple and delicious! I need me some of those ramekins. Hi Pragati, thanks so much and it was a lovely day picking the blueberries out at Terhune Farms. I have indeed been quite busy preparing from among the bags we picked, and we are enjoying them immensely. Thanks much for stopping by. Those blueberries look really fresh! Nothing beats going to a pick-your-own farm and getting fresh fruit to take home. It’s a great experience for friends and family. 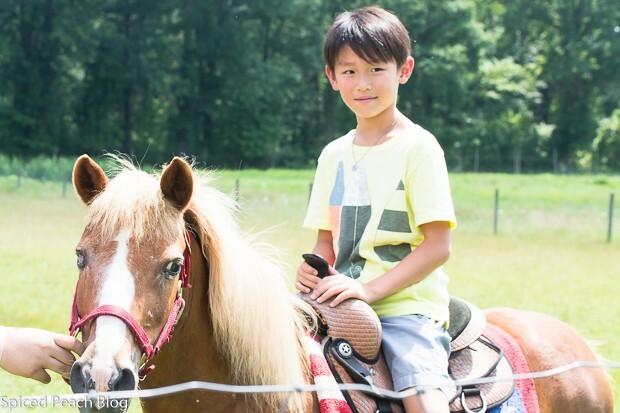 Thanks for sharing these photos! 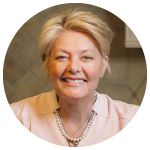 Ellen Parlee recently posted…More Strawberry Season Recipes to Try! Hello Ellen out at Parlee Farms in Tyngsboro, Mass. Thanks so much for your time in stopping by. I so agree that nothing beats picking your own farm fresh products and taking them home, and then enjoying the bounties in their preparation. I also prepared a blueberry bread not yet posted- but the combination and the fullness of those fresh blueberries made it something really, really exceptional! Too bad I live so far but your PYO looks so lovely I’ll have to pass it along to Kelly Rodriguez one of our Northeast Bloggers in the Boston area when she returns from Spain. Bet she would love it! Thanks again Ellen, enjoy August and remaining summer days of the season.